At least that's the most common version of this trope. For some reason as a work moves from one medium to another characters' hair colors will be changed, costumes will be toned down, color schemes will be swapped about or adjusted. While occasionally there may be a justification for this (as may be the case for works which were originally in Black and White or monochromatic), more often than not it is just a random change made as a work is adapted. One particularly common adaptation dye job for costumes is that more often than not, in a movie adaptation, everyone now wears black. (This is mainly due to Rule of Cool and black just looking good on camera.) Conversely, in animated adaptations, colors are often brightened, diversified, or flattened, to make things easier on the character artists and for maximum visual clarity on a small screen. Related to Spell My Name with an "S". Can be related to Race Lift, if the skin color changed with the hair. Though the visual effect can be similar, this is not related to Palette Swap. Dyeing for Your Art can avert this, though it won't always. See also Hair Color Dissonance, Early Installment Character-Design Difference, Inconsistent Coloring, Suddenly Blonde, and Sudden Eye Colour. In The Phantom, Diana Palmer has black hair. In the 1996 movie it's a light brown, possibly as a point of difference from the raven-haired Dark Action Girl Sala. Depending on the Artist this occurs in Sonic the Comic  Online!, the fan-continuation of Sonic the Comic. Artists switch between the SegaSonic eye colors and the Fleetway colors. For example, whether Amy has green eyes or brown eyes depends on which they prefer. Sometimes they change colors within the same issue. This is rather unclear in the case of Soichiro in Kill la Kill AU, as, canon-wise he was usually he was seen in flashback, which are shown in a kind of sepia, or in silhouette (as is the case of a childhood photo of Satsuki) so we normally haven't a clue what color his hair was, leading for it be guessed on. Here its shown as being kind of brownish. Likewise, this is somewhat the case with Rei, whose hair in canon is something of a lilac, not lavender, however, some of the comics vary as to what shade her hair color is. In Cellar Secrets, this is averted in the case of Shiro, Ryuuko, and Satsuki's hair colors, as they are as they are in canon, however, Nui's hair either a tawny-ish or something of a very light brown, instead of blonde as in canon, along with it being shorter. Likewise, Uzu's hair is dyed green but his natural hair color is a dark brown, Nonon's hair is a darkened auburn, instead of pink, Houka's hair is onyx, and Rei's hair was dark gray (almost black). In Marvel Infinites, Franklin Richards now has brown hair rather than the blond hair he has in the comics. In Neither a Bird nor a Plane, it's Deku!, Izuku goes from having green hair to black hair due to being Kryptonian in this story. His eyes also go from green to dark brown. In Live a Hero, this trope is taken to its most literal extent. Because Izuku is not Inko's biological son, his hair is naturally black. He dyes it green in order to feel closer to her. Rokuna, an imported character from Mon Colle Knights, had her hair not only significantly lengthened for a beehive but also changed from green to brown for the Lucky Star fanfic Starbound. Cinderella was a strawberry-blonde in the animated Disney film, but is made a much lighter shade of blonde in Cinderella (2015). Lady Tremaine had grey hair but now has red hair. Anastasia's red hair is darkened to auburn and Drizella's dark hair is lightened to red. The Duke, black-haired in the animated film, has a bright orange mustache here. Likewise since the Fairy Godmother is younger, she now has blonde hair instead of white. The Little Mermaid gives Ariel's sisters different eye colors in the prequel The Little Mermaid III: Ariel's Beginning. Cinderella originally had something like a strawberry blonde/red hair color going on, but the merchandise sells Cinderella dolls with clean blonde hair. The Hunchback of Notre Dame has a small detail changed about Esmeralda's eyes. Her name is Spanish for "emerald", which reflects her eye color. However, the sequel depicts her with blue eyes. The Lion King definitely had something weird going on with Nala in the sequels. Her original eye color was teal, but she has blue eyes in Simba's Pride, green eyes in 1 1/2, and blue again in The Lion Guard. Kiara had a similar issue. Her eyes were teal like Nala's at the end of TLK, but were changed to red like Simba's in Simba's Pride. (Though fanon believes them to be two different cubs). Even though Rapunzel from Tangled is revealed to be a brunette towards the end of the film, all of the dolls (and almost all the licensed books) have her with long blonde hair. Granted, they tend to depict her the way she looks in the film before her hair reverted to its original color. Surprisingly enough, if you look closely in Frozen, you'll see what's supposedly Flynn and Rapunzel, and Rapunzel's hair is in its short brown rendition (likely because using the blonde hairstyle would make no sense). Tangled: The Series has her with the signature blonde hair however there is an in-series reason for it, and it takes place before Tangled Ever After so it's a Foregone Conclusion she will be back to being brunette by the end. In the stage version of The Little Mermaid, Ariel's sisters often have their tail colors switched up, e.g. on the 2016-2017 tour, Alana (originally violet) was yellow, Aquata (originally blue) was orange, Arista (originally red) was blue, Adella (originally yellow) was indigo, Andrina (originally indigo) was red, and Atina (originally orange) was violet. In addition, all six mersisters, who were originally various shades of blonde and brunette, (usually) have their hair colors changed to match their tails. Belle's hair is Emma Watson's natural light golden brown instead of the darker chestnut brown of the original animated Belle. Mrs. Potts has younger-looking auburn hair in her human form instead of elderly-looking white hair, while her son Chip's human form is changed from blond to brunet. Lumiere, Cogsworth and Plumette all wear white wigs in their human forms, while the animated versions displayed their own brown hair, or in the men's case, at least wigs that were natural shades of brown. The three Village Lasses (a.k.a. Silly Girls, a.k.a. Bimbettes... Gaston's fangirls) are brunettes instead of the original Dumb Blondes. Star Wars: In Rogue One, Forest Whitaker was cast as Saw Gerrera, despite looking nothing like his animated rendition. Rebels sticks to the Rogue One design, except for the eyes. His eyes go from blue in The Clone Wars, to green in Rebels, then to brown in Rogue One. And that's not even mentioning his skin tone, or "Forest Whitaker eye". Harold Ramis' brown upright Eraserhead-esque hairdo was replaced with a blond pompadour and rat-tail when Egon Spengler was translated from movie (Ghostbusters) to cartoon form (The Real Ghostbusters). Likewise Ray's hair went from Dan Aykroyd's brown to red. In case this wasn't enough to distinguish the main characters, they all got different colored uniforms as well. Janine Melnitz became a spiky-mulleted '80s fashion plate. Her later-seasons look, somewhat more subdued, was then ported to the second live-action movie (although it meant Annie Potts now wore a bright red wig rather than her natural brown hair being shown). Half the characters went through adaptation eye-color changes, too: Egon's eyes went from Ramis's brown to blue, Ray's from Aykroyd's brown and green heterochromia to brown, and Peter's from Murray's blue/bluish hazel to green. Even Egon's glasses changed color, from silver wire rims to bright red much thicker frames. Agent L was a brunette in Men in Black, but in the cartoon, she was blonde. The show seems to be in an alternate continuity of some sort (K is still active), but still. The official explanation is that Men in Black is a movie in the reality of the animated series as well. Honey, I Shrunk the Kids: Amy has blonde hair in the movies, but in the T.V. series, she's a redhead. In an inversion of the way this trope usually plays out, the novelization of Pacific Rim turned brown-haired Hermann Gottlieb into a blond (it also gave him a German accent as opposed to the stuffy English one he uses in the film, and made no mention of the fact that he walks with a cane). This is justified by the fact that the novelization was based on an earlier draft of the script rather than the film itself. In the Casablanca TV series, Rick goes from dark-haired and brown-eyed to being played by blond, blue-eyed David Soul. Audrey in The Little Shop of Horrors is a brunette. However, she is almost always a blonde in the theater adaptation. Percy Jackson and the Olympians was infamously maligned for its many inaccuracies (the director decided not to read the book, full stop) but one of the most grating to fans is that Annabeth, whose blonde 'princess curls' are constantly mentioned, was played by Alexandra Daddario, a brunette. Her hair is changed to a golden blondish color in the sequel without any explanation. Daddario also retains her natural blue eyes in the films, despite the defining trait of Athena's children is having the same shade of grey eyes. Molly's Game: The real Molly Bloom has dark brown hair, while Jessica Chastain's portrayal of her has reddish-brown locks. Cloud Atlas: Sonmi-model fabricants are implied to have white hair in the novel; in the film they have black hair with a few streaks of bright color. Gottlieb's Mayfair, based on the film version of My Fair Lady, depicts the brunette Audrey Hepburn as a redhead (on the backglass) and a blonde (on the playfield). Kirk's eyes are hazel and McCoy's are blue. In the reboot movie it's the exact opposite. Bally's Star Trek pinball has Spock wearing a green full-body jumpsuit on the playfield. Legion: Legion is black-haired in the comics, but his TV counterpart's hair is light brown. The Eleventh Doctor is depicted with odd blondish hair in his earlier outfits in Doctor Who Legacy. This may have been an attempt to distinguish him visually more from the Tenth. Gilligan's Island: In the animated spin-offs, Ginger was changed from a redhead to a blonde in order to ward off potential complaints from Tina Louise over using her likeness. Steve Trevor, blond in the comics and most adaptations, is here played by the brunet Lyle Waggoner. The same thing happens to Paula Von Gunther. And the exact opposite happens with Fausta Grables, who was brunette in the comics but played by the blonde Lynda Day George on the show. Young Sheldon: Mary and Missy Cooper are blondes in this show, even though they have brown hair in The Big Bang Theory. It's possible that either their hair turned darker as they got older (which is a common occurrence with natural blondes) or they dyed it when they were older/younger. In Norse Mythology, Thor had red hair, but The Mighty Thor turned him into a blond. Likewise, Loki is a redhead, but he is often portrayed to have dark hair. There have been multiple interpretations of what Jesus looked like. Some movies have actors with either brown or blue eyes and few examples have him with blond hair. An all-Asian production of Sweeney Todd: The Demon Barber of Fleet Street who thought a blonde wig would look odd on a clearly Asian actress steered around the problem of Johanna's frequently invoked blonde hair by simply changing all references to her "yellow hair" to "raven hair" and removed the Wigmaker's Song (which lists several different shades of blondness, so Anthony will know how to refer to Johanna's particular hue) entirely. Sarah Chagal had straight red hair in The Fearless Vampire Killers, or Pardon Me, But Your Teeth Are in My Neck, but in early stage productions she was a curly-haired brunette. However, in newer productions she's still a redhead. Magda, the maid, was a blonde in the movie but has red hair in the German, Austrian and Japanese productions of the musical. (She's still blonde in Poland, Hungary and Russia). Alfred is an interesting case: brunette in the film, but on stage has whatever hair the actor has. This leads to the need for the costume department to make a wig that looks like the actor's hair for his dance double in the Act II Dream Ballet. Except in the Hungarian version, where for some reason Alfred's dream ballet double has a freaking buzz cut. Count von Krolock in the movie had short grey hair and in the very first production of the musical his hair were still grey, but much longer. However, in all the productions who came after he has long black hair (sometimes grey-streaked). Herbert, von Krolock's son, had short golden hair in the movie, but in Austrian and German stage productions his hair are pulled back in a shoulder-length ponytail. The hair color always kept changing: sometimes it's pure white, sometimes it's dark with heavy white streaks, sometimes the streaks are blond rather than white, sometimes it's blond with dark streaks or it's just blond. However, in almost all non-German-language productions (except the 2009 Vienna revival) Herbert has really long, flowing, platinum blond hair. The Japanese production is the only one in which he has long, black hair like his father. In Animal Crackers, the Professor (Harpo) makes his entrance with balloons in his mouth, which he proceeds to inflate. Spaulding (Groucho) asks him, "You haven't got strawberry, have you? ", and he produces a red one. The 1930 movie version, being filmed in black and white, changed "strawberry" to "chocolate". In the original stage production of Grease, all five Burger Palace Boys had dark hair. In the film adaptation, Kenickie and Roger (who was renamed "Putzie") are blond. While Sandy was intended to be a blonde, the first actress cast for her on Broadway was a brunette, as well as the first actress to play her in the 2007 revival. However, the popularity of the film (and the creators' intent) usually means that blonde women will be cast in this part. In the libretto of Puccini's Madame Butterfly, the title character's son is described as having blond hair and blue eyes, despite being half-Japanese. Frédéric Mitterand's 1995 film version and many recent stage productions have more realistically given him dark hair and dark eyes instead, with the text changed accordingly. For the movie adaption of A Chorus Line, at least three female characters who are usually known as brunette or redheaded were switched to bleach blonde. Pewku the Ussal crab went from being blue and yellow to a more realistic brown and gray. These colors were carried over into her tie-in toy as well. The eye colors of Tahu and Turaga Vakama (pink), Gali (yellow), Lewa (lime green), Turaga Nuju (blue) and Turaga Whenua (dark green) were all changed to a reddish orange. The mostly metallic-gray, silver, black and bright red armor of Makuta became dark red with prominent green corrosion-spots. Takanuva's dark-gold and white color scheme was replaced with all-gold. Hahli's yellow eyes turned blue. Toa Lhikan's and Toa Vakama's lime eyes, as well as Onewa's dark blue eyes and Turaga Dume's dark orange eyes turned bright yellowish orange. However Vakama's original green eyes were later used to represent his FaceHeel Turn. Nokama's orange eyes became blue. Nuju's and Kopaka's blue eye color was replaced with orange or red for their telescopic eye-piece. The transparent bright lime "cheek" colors of the Rorzakh became solid black, and the bright blue on the Zadakh was replaced with solid yellowish-brown. The latter's blue eyes also became lime green. Nivawk may be the most egregious case, as the originally black and silver colored creature became striking red, purple, yellow and bright blue for his movie appearance. Krekka's dark blue armor was recolored dark green. Nidhiki's green eyes were replaced with red and yellowish orange for the pupils. Roodaka's orange eyes were changed to blue, although the turned red when she got angry. Keetongu's red eye became blue. The Mata Nui robot's lime green eyes became yellow. In the Japanese dub of the G1 cartoon, the error was corrected by reversing the characters' identities, which worked well since they were depicted as interchangeable anyway. The Generation One Sweeps (and Scourge) toys have beards the same color as the face (white or very light grey). In the cartoon, they shift between dark greyish blue, blue, dark grey, and black. In a rare instance of a release-related dye job, Pizzazz was always depicted in doll and animated form with bright green hair. The R1 Rhino masters inexplicably changed her hair color to a dull olive blond - and also redid the green parts of her costume to match this. In a doll-related change, the title character is known for her pink hair, but the dolls were always blond. 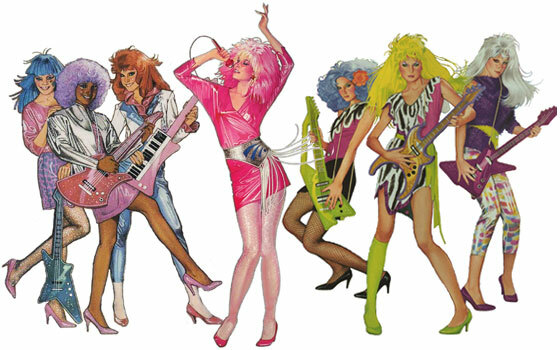 Promotional art for the show (such as this ◊) that showed up on places such as doll boxes and VHS covers depicted a realistic art style gave Jem predominantly pink hair, but added blonde bangs. All of the characters also had more "realistic" hairstyles for the period, but were still reasonably close to their animated and doll line styles. Terri Cloth is a redhead instead of a blonde. The hair on Split Kit's good half is brown, when he had blond hair on his original trading card. 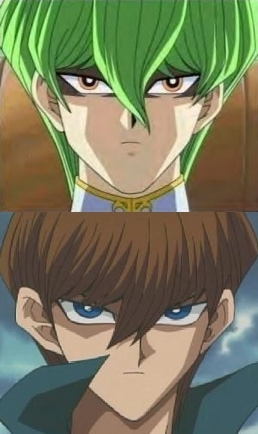 In the sound novels and manga, Keiichi has blue eyes. They're the exact same shade as Rena's in the manga, but darker (and with a slight purple shade; mostly in the remakes) in the sound novels. In the anime however, they're full-on purple. A larger example is in the live action movie adaptations. All the oddly colored characters have "natural" colored hair. This caused an Internet Backdraft because you couldn't easily tell the girls apart. Rika has short hair instead of long hair, Satoko has longish hair instead of short hair, and the teens look similar if they aren't in their Higurashi costumes (which they usually aren't). Umineko: When They Cry's anime adaptation changed everyones eye color, which didn't work well since it was plot related. OZMAFIA!! : Dorian Gray has blue hair instead of his original blond. Steins;Gate: Kurisu Makise has chestnut brown hair in the original visual novel. In the anime adaptation, she has red hair instead. The heroine originally had light-brown hair. The anime gave her a more dark-tea colored brown shade, and added a pink gradient to her tips. Rika has very pale, almost platinum hair that has a green-ish sheen to it. The anime altered this to a simple blonde, matching her eyes. The Nostalgia Chick pointed out that the real life John Smith from Pocahontas was short, portly and brown-haired, unlike the tall, blond Adonis we get in the Disney adaptation. Knowing John Smith, he wouldn't want it any other way. The Comic-Book Adaptation of Noob (that has its own page) has varying degrees of that, but the most visible is Gaea's dress and hair becoming lighter. The reason is that the comic is supposed to look more like a video game than the webseries with generally brighter colors. Another more technical one is that both dark brown and black exist among the actors and the dark browns were probably made lighter to not have too many dark-haired characters. Examples of this include Sweden being changed from a light blond to a sandy brown (before switching back to blond in his later animated appearances), Italy's hair changing from brown to auburn (sometimes a saturated red), Belarus going from platinum blonde to dark blonde, China's black hair changing to brown, and the other blond characters either having their hair darkened or changed to a more saturated yellow shade. Himaruya himself has also been inconsistent when it comes to hair and eye colors: Prussia originally had dark blond hair and blue eyes, but now his hair varies from being platinum blond to outright white or grey, while his eyes are now either red, "red-violet", or pink. Russia, Finland, Latvia, and Iceland originally had blue eyes, but appear with violet ones in later illustrations. Belarus and France also occasionally receive violet eyes instead of their usual blue. UK's shade of blond varies throughout all colored illustrations, Canada's hair was originally two-toned, and Hungary is either a blonde or brunette. Monaco was also originally a brunette with brown eyes, but was quickly changed to a blue-eyed blonde (and even then, her shade of blonde can vary). Germany wears a green uniform in the manga, but the first four seasons of the anime changed it to teal (unless his jacket was undone), possibly to downplay the SS connection. His Iron Cross was also removed. The fifth season reverted his uniform back to its manga coloring. Hetalia: The Beautiful World (the fifth series) undoes some of the previous anime dye jobs, with Belarus back to being a platinum blonde, and Romano having green/hazel eyes. But it again plays this trope straight with giving Iceland blond hair to match the other Nordics, when his previously established hair color was silver in the manga. France is also given platinum blond hair, as well as a very pale complexion, when his hair in the manga is a darker shade of blond. Belgium's hair also suddenly goes from being golden blonde to a mousy brown. YouTube artist LavenderTowne (Haley Newsome) discusses this trope in a series of videos where she draws characters of various books based on their described literary appearances and comparing them to their film adaptations. This is beginning with Harry Potter. Ivanhoe: The King's Knight features redheads Richard and John with grey and black hair respectively, of course in Richard's case it may have just been a case of him having gone grey early and his hair having originally being red or, if John is any indication, black. Also none of the main Saxon characters are fair haired. Janine was a blonde, up until season 3 where her hair suddenly became dark brown. Sylvie (or Simone) had greenish-colored hair while Monique's appeared to be a pink color. Both of them received brown hair in season 3. Ellie also had greenish hair early on, but it was darkened to black by season 2. Stormer and Pizzazz keep their hair blue and green respectively however it's suggested to be dyed instead of natural. Ashley had light blonde hair in the cartoon but in the comics it's a more orange shade. Castlevania (2017) kinda zig-zags this trope as there have been many previous variations of the characters in video games, but its mainly based of Ayami Kojimas artwork. Alucard looks pretty much identical to his Castlevania: Symphony of the Night design which ironic in itself as the Netflix series is based on Castlevania III where Alucard just looks like a stock Bela Lugosi vampire, In the Netflix series Alucard has pronounced blonde hair like his mother Lisa instead of the Mystical White Hair often seen in the video games. Trevor Belmont stays pretty much the same, being brown-haired like the NES game and the second PS2 game in the series, Curse of Darkness. Only on the U.S. boxart for the NES game, was Trevor drawn with blond hair. Sypha though its hard to tell with her hood (which helped disguise her gender) has blonde hair as the ending revealed and of which Castlevania Judgement as well the Pachislot game confirmed. But the Netflix series however gives Sypha ginger coloured hair instead. Since Syphaa descendant Simon Belmont is occasionally depicted with red hair, maybe its fitting. Dracula himself has dark hair instead of the white he had at the start of the book and some Castlevania games, this can be handwaved however since he is depicted with black hair just as commonly. Carmilla when she isnt a disembodied weeping mask is usually depicted as a woman with dark hair, brown hair or wavy blue flaming hair in the games. In the Netflix series however Carmilla is firmly White Hair, Black Heart. Preliminary photos from the live action movie adaptation of Avatar: The Last Airbender show that the costumes of the characters have been seriously toned down. The movie tries to justify it since bringing the bright colors of the cartoon into the relatively muted real world would make the characters look cartoony, which ignores the fact that many of the cartoon's brightly-colored costumes are based on real-world outfits . A similar justification is given for the relatively muted costumes in the X-Men Film Series. The Chipmunks and The Chipettes went through different eye colors throughout the franchise: Theodore* Black eyes in The Alvin Show, The Christmas Special drawn by Chuck Jones, Alvin and the Chipmunks episodes done by Ruby-Spears and in Alvin and the Chipmunks Meet Frankenstein; Green eyes in The Chipmunk Adventure, Alvin and the Chipmunks episodes done by DiC/Mukarumi-Wolf-Swenson, Alvin and the Chipmunks Meet the Wolfman, Little Alvin and the Mini-Munks, Alvin and the Chipmunks, The Squeakquel and Chipwrecked]] and Eleanor* Brown eyes through the Alvin and the Chipmunks cartoon series, The Chipmunk Adventure and Alvin and the Chipmunks Meet the Wolfman; Green eyes in Little Alvin and the Mini-Munks, Alvin and the Chipmunks: The Squeakquel and Chipwrecked went through two eyes changes, Alvin* Black eyes in The Alvin Show, The Christmas Special drawn by Chuck Jones, Alvin and the Chipmunks episodes done by Ruby-Spears and in Alvin and the Chipmunks Meet Frankenstein; Blue eyes in The Chipmunk Adventure, Alvin and the Chipmunks episodes done by DiC/Mukarumi-Wolf-Swenson, Alvin and the Chipmunks Meet the Wolfman and Little Alvin and the Mini-Munks; Amber eyes in Alvin and the Chipmunks, Alvin and the Chipmunks The Squeakquel]] and Chipwrecked, Simon* Black eyes in The Alvin Show, The Christmas Special drawn by Chuck Jones, Alvin and the Chipmunks episodes done by Ruby-Spears and in Alvin and the Chipmunks Meet Frankenstein; Gray-Blue/Blue-Gray eyes in The Chipmunk Adventure; Blue eyes in Alvin and the Chipmunks episodes done by DiC/Mukarumi-Wolf-Swenson, Alvin and the Chipmunks Meet the Wolfman, Little Alvin and the Mini-Munks, Alvin and the Chipmunks, The Squeakquel and Chipwrecked and Jeanette* Green eyes through the Alvin and the Chipmunks cartoon series, The Chipmunk Adventure and Alvin and the Chipmunks Meet the Wolfman; Brown eyes in Little Alvin and the Mini-Munks; Purple eyes in Alvin and the Chipmunks: The Squeakquel and Chipwrecked went through three, Dave* Black eyes in The Alvin Show, The Christmas Special drawn by Chuck Jones, the Alvin and the Chipmunks episodes done by Ruby-Spears and in Alvin and the Chipmunks Meet Frankenstein; Gray-Blue/Blue-Gray eyes in The Chipmunk Adventure; Brown eyes in Alvin and the Chipmunks episodes done by DiC/Mukarumi-Wolf-Swenson, Little Alvin and the Mini-Munks, Alvin and the Chipmunks, The Squeakquel and Chipwrecked; Blue eyes in that one Easter Special done by DiC and Alvin and the Chipmunks Meet the Wolfman went through four and Brittany* Blue eyes through the Alvin and the Chipmunks cartoon series, The Chipmunk Adventure, Alvin and the Chipmunks Meet the Wolfman, Little Alvin and the Mini-Munks, Alvin and the Chipmunks: The Squeakquel and Chipwrecked is the only one who retained the same eye color thus far. My Little Pony: Friendship Is Magic: Up until 2011, Princess Celestia was often bright pink in the toy line, while she was more pinkish-white in-show. Similarly, her sister Princess Luna is more purple in the toy line, while she's dark blue in-show. In Hey Arnold! The Movie Big Bob Pataki has brown hair despite the fact that his hair was gray in the Hey Arnold! series, which Word of God would attribute to Bob dying his hair because he was going through a mid-life crisis. It was changed back to gray in Hey Arnold! The Jungle Movie. In The Movie of Inspector Gadget Chief Quimby has greying dark brown hair. In the original cartoon his hair is a reddish brown. And in the 2015 cartoon he's blond. While the Mach 5 in the original Speed Racer was almost completely white, in The New Adventures of Speed Racer it's mostly blue. Also, Trixie was originally a brunette but is now blonde. In the Live-Action Adaptation of Dudley Do-Right, Dudley was brown-haired (like Brendan Fraser) instead of blonde, while Nell was blonde instead of a redhead. In George of the Jungle, also starring Brendan Fraser, George's hair is brown instead of black and the originally redheaded Ursula becomes a blonde. According to her one colored cartoon Betty Boop was a redhead. Modern depictions of her consistently depict her with black hair. H2O: Mermaid Adventures: Rikki has been made a red-head as opposed to the blonde she was in the original series. In SpacePOP, while in the show the girls' hair colors are natural, in the books the girls have different hair colors before dyeing them to match their official art. Beast Boy has a completely different hairstyle then he did in Teen Titans. It resembles his contemporary comic book hair more. Blackfire is much paler than in the 2003 cartoon. Starfire has hot pink hair rather than the usual red hair she sported in the original animated series and DC Nation spin-off shorts. Raven has black hair instead of purple, and the hairdo is also different. Dojo is a yellow dragon with green spikes, while in the original series he was the opposite. Master Fung has grey facial hair instead of black. Chase Young's entire colour scheme is different. For starters, his hair is more of a dark green rather than jet black with green highlights as it was in the original, although in-universe it's probably still black. Depending on the light, it varies between green and black. His eyes changed from amber to dark brown and his shirt and pants changed from black to brown. His armor's colour scheme is also different, having shades of dark green and brown as opposed to bright green, black and red. Wuya is Ambiguously Brown in the first cartoon, but in the second she went through a Race Lift, having a skintone more akin to an Asian. Also, her hair's shine is pink instead of bright red. Jack Spicer had red eyes in the original series, while here they are changed to black for his 2D design. The only instances where his eyes are red are the CGI animated Showdowns, where Omi also suddenly gains brown eyes (something he never sported before). In Batman & Mr. Freeze: Sub-Zero, Veronica Vreeland, who is a redhead in Batman: The Animated Series has blond hair. This may have been done to distinguish her from Barbara Gordon in the same scene. Bugs Bunny was given mauve fur in the first season of The Looney Tunes Show. It was changed back to its trademark gray color in the second season. Les Sisters: In the comic books, Sandrine had black hair while William had brown hair; the animated series switches their hair colors so William has black hair and Sandrine has brown hair. In Voltron, Coran, Allura and Pidge had light brown hair, blond hair and dark brown hair respectively. In the Continuity Reboot, Voltron: Legendary Defender, Coran is a redhead (like his voice actor Rhys Darby, though Darby is auburn-haired), while Allura has Mystical White Hair and Pidge has reddish-brown hair. She mentioned in Batman: The Animated Series that she's not a real blonde. DC consistently depicts her as a natural blonde in comics. She sported dyed white hair in Batman: The Brave and the Bold. She has black hair in Arkham City: Harley Quinn's Revenge and Injustice Gods Among Us. It's changed again in Suicide Squad (2016)... sort of. She's still blonde—but like in Batman: Arkham City the tips of her pigtails are dyed, though the black was replaced with blue. While averted in the series proper, in the original, unaired pilot of Birds of Prey, she has black hair. In Big Hero 6, Honey Lemon is depicted with blond hair, while in the cartoon, she has orange-red hair. Batgirl in the Shea Fontana series wears a dark blue suit, while in the Lego projects, she wears purple. In the Lauren Faust series, she keeps the purple suit, but now has green eyes instead of blue. Zatanna normally has black hair, but in this series, she has purple hair. In Marvel's Spider-Man, Harry Osborn has black hair instead of either red-brown or blond like in other shows. Similarly , Alistair Smythe has ginger hair instead of brown. Likewise, Peter Parker has green eyes instead of black, blue, or brown. Both Despero and Katma Tui had their skin color changed in Justice League, respectively to purple and orange from magenta. In Katma's case, she a Korugarian like Sinestro (and in fact, was his replacement after the Guardians canned him). Ancient Rome often gets this. Many movies, shows, and games portray Italians of antiquity as looking (and sounding) Northwest European. However, genetics tests have repeatedly shown that the Romans should have looked much like Italians today (central/southern Italians specifically; northern Italy AKA Cisalpine Gaul wasn't considered Italian until after Julius Caesar's death), and thus, had features noticeably different than the typical Englishman or German. This is bared out in what little examples of well-preserved contemporary paintings and mosaics have, such as the realistic frescoes at Pompeii (~150 miles southwest of Rome) and the older tomb paintings at Tarquinia (~60 miles northeast of Rome), which depict mostly olive-skinned people with dark eyes and hair (as well as other typical Mediterranean features such as curly hair and large noses), plus a smattering of pale light-eyed blondes/redheads, matching modern Italian looks. The rareness of light features such as pale-to-ruddy skin, blonde/red hair, and blue/green eyes was commented on in many Roman sources, with northern "barbarian" peoples such as the Gauls and Germans being specifically noted for having this appearance. Wigs and dyes to give the appearance of light hair even became popular for a time in Rome among women due to its perceived exoticism and rarity. Bolívar, el Héroe has this in almost every historical character, putting them strange hair colors. In 1994, it was discovered that Ramesses II was a redhead, an uncommon but very much possible phenotype in North Africa. You'd never know by films such as The Prince of Egypt or A Tale of Egypt keeping Ramesses black haired. Many dinosaur picture books will actually have the dinosaurs colored differently in each book depending on the illustrator. This is because, apart from a handful of feathered species, no one really knows what color dinosaurs really are, so it's up to the illustrator's imagination to determine what they really look like. In The Tudors, Henry and Catherine of Aragon (both with reddish hair in Real Life) were played by brown-haired actors. On the other hand, while Natalie Dormer (a blonde) was cast to play the famously dark-haired Anne Boleyn, she convinced producers to let her play Anne as a brunette. The former caused some consternation among the producers and investors of the series when an English PR flack, asked why Henry was to be played by a brown-haired actor, replied with melodramatic insincerity that it was "just so sad" but Henry had to be played by a handsome actor - implying that it was obviously impossible for a redheaded actor to be handsome! Officials at Showtime and the CBC were not impressed, especially given the common North American belief that the English dislike of red hair is nothing but plausibly deniable anti-Irish prejudice. Wolf Hall, unlike The Tudors, has the right hair color for Henry, but its Anne Boleyn, who rather famously had dark eyes in real life (and is correctly described as having them in the book! ), has blue eyes. The real Balto had dark brown fur and a patch of white on his chest. The Balto animated film gave him greyish-brown fur with lighter fur going from his chest to muzzle. It also gave him an Adaptation Species Change from dog to being a wolf-dog hybrid.